April in the Northern Hemisphere is Spring Time. The days are getting longer. The grass is turning green. Spring flowers are starting to bloom and leaves are starting to appear on trees. And if you look very carefully, and you are young at heart and truly believe, you might be fortunate enough to see the Fairies. Hasn’t everyone at some point wanted to be a Fairy? Have the ability to fly and play tricks on unsuspecting people? Any other donations for prizes thankfully accepted. Where would I get woodland Fairies for free???????? That is part of the challenge. But I would probably start with a set of wings. AprilYSH has a nice set here and she also offered a different set of wings in an issue of DS Creative Magazine on Page 19. Do you own a version of the Morphing Fantasy Dress Saphirewild? If you don't I would highly recommend purchasing it for your favourite version, ie: V4, Genesis, G2F, G3F. It is very versatile and the textures can be used on all of them. There is a thread with links to free MFD textures here. Thanks Kismet for the great links, it is a great start!! No I do not own the MFD, have wanted to get it since I first saw it but funds are low right now might get it in the future I hope!!! This seems like it would be good to start to learn to setup lighting. Can you use DAZ freebies from long ago? Like if I go to my purchased list in accounts there are freebies from several years ago. Rules seem to say no DAZ Freebie can be used released before 2016 Feb 1st. To be listed as a freebie for the contest the DAZ Freebie has to be an item that is free during the current month. Any PC+ weekly freebies that are released during the month of April are allowed. The idea behind the Freebie Contest is to point out items that are currently available free for use. Thanks. I misunderstood then, I though it had said up to two months back. I'll have to see what's free this month. You are correct about that. You are allowed to use weekly freebies from March and April but all others are now considered Paid Items. I had to get clarification on the rule. It's been a while since I hosted the Freebie Challenge. Sorry for any confusion. I finally finished getting all I need for this render now I just have to get it all put together in my head and get it on here!!!! Giggles!!! A little girl and her younger brother are walking in the forest and stumble upon the home of the forest fairies. Thank you for participating Jonttex82. Cute Avatar. Orco is quite a little character. Please transfer to the Entries Thread. LOL - fun theme! This ought to be hilarious! I am really looking forward to seeing renders for this month! 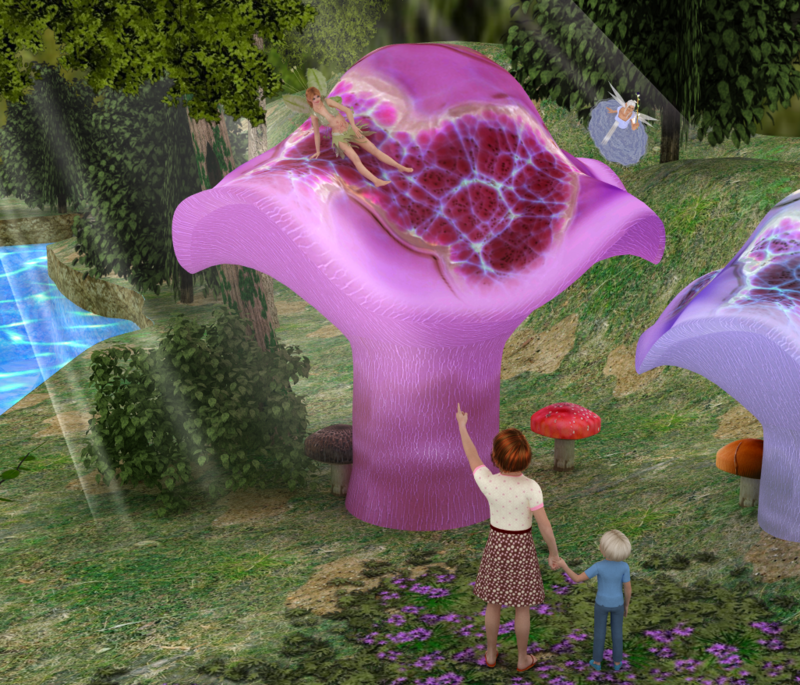 Now those are some gigantic mushrooms... magic mushrooms, in more ways than one I gather! Merged 2 posts in from the entry thread. Ooops, was that me? Sorry Cho! I've been away so long I can't even recognize Entry threads from Main ones! DAZ3D April, 2016 Freebie Challenge: "When I Grow Up I Want To Be A Woodland Fairy"
"I'm not sure that this is such a great way to meet girls, Rob. ", moaned Archie. "And my leotard is riding up!" "Tell me about it! There should be a manual with these things, or something." "I don't think this bra fits right, either." "Wait! What? You're wearing a bra?" "Well, yeah, it came with one." "Oh, Brother. Anyway, quit complaining before Granny over there decides to turn you into a pumpkin!" No Counts: DAZ Aiko 3, Aiko 4, Victoria 4, Genesis and a whole lot of morph packages that go with them. Rendered in DAZ Studio with 3Delight, no postwork. Aiko 3 - Fairy on the left. Aiko 4 - Fairy on the right. Genesis Male 1 - Fake fairy on the left, dialspun character. Genesis Male 2 - Fake fairy on the right, dialspun character. Victoria 4 - The fairy instructor. Lol! I almost choked on my soda... Bad enough that it went up my nose! Love the storyline. Fantastic work! Thanks, Skywalker. Glad you liked it. Please move to the Entries Thread. Fortunately I was not drinking or eating when I read the story. Great concept SixDs and some really nice freebies in there too. Thanks, Kismet. And yes, I agree, there are some great freebies in there. Everybody got a different set of wings, and I still had more to choose from! My second entry is here. Meet Sugar, a little 5 year old girl who's biggest dream is to become a fairy, when she grows up. Also meet her older brother Spice, who definitely does not want to become a fairy and while he loves her sister a lot, he's not too fond of putting on a dress and playing fairy with her. Spice: But mom, I don't want to do this! Someone might see me like this! Mother: No buts young man! You either play fairy with your sister (and like it) or you can pick up a phone and call your teacher to tell her about that thing you did today in school. That thing, you accidentally told me about, that would lead you in to a lot of trouble, if she knew. OUCH - blackmail from your own mom! Wasn't it bad enough he was named "Spice"? Sounds like mom really wanted another little girl, LOL! Nice work! Really like the reflections on the hardwood floor. Nice work with the little details like the cover of the book mom is holding and the pile of clothes on the floor. Nice entry jonttex82. The link for the #10 Round Carpet did not work. But even without it you have enough free items to qualify. There was a missing colon in the link address, but I fixed it, that link should work now too. Very nicely done, jonttex82. I think Dad needs to step in.